Well-drained. Prefers a limey soil. Zone 5. Provide winter protection. Borders. rock gardens. Scented foliage and flowers. Plant in warm. sheltered position. Do not attempt division. Winter mulch with loose materials. Widely prized for its beautiful fragrance, lavender is a joy in either the flower or herb garden. It grows 12 to 16 inches tall and has spikes of lavender flowers from midsummer to early fall. Both foliage and flowers can be used for sachets and potpourris. 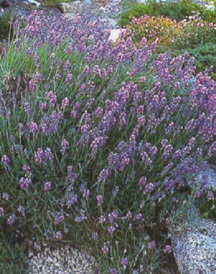 Most references state that lavender is hardy only to zone 5. However, with some care and the right situation, it can be enjoyed here. The Munstead strain is perhaps the hardiest. Give it full sun, a well-drained soil, and a good winter mulching of loose material such as straw or evergreen boughs. Be sure that hard frosts are past before removing the mulch - or be prepared to recover the plants in a late frost. Division is not generally necessary. If plants are divided, do it only in the spring so that plants have a season of growth to establish themselves before winter. Plants should be spaced 12 to 18 inches apart.